Driving with a Porsche classic car through the Styrian Mountains in Austria or on the race track – photos of the Ennstal-Classic and Racecar-Trophy. 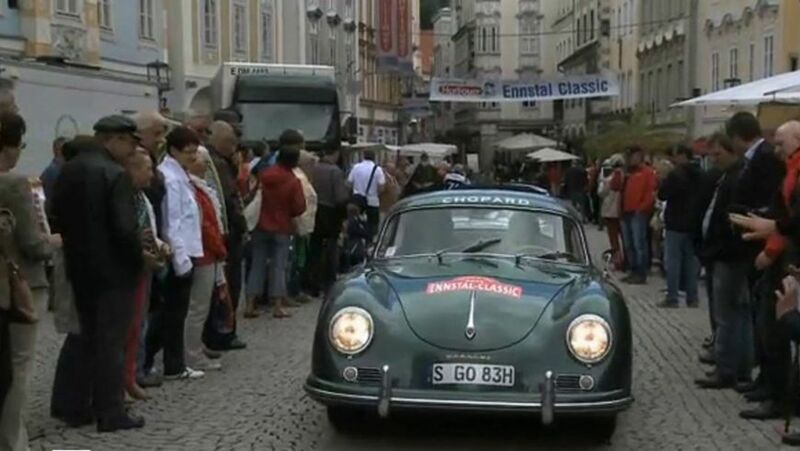 A mountain prologue, routes through the Tauern Mountains and a city Grand Prix: the Ennstal-Classic means total pleasure for lovers of classic cars. The Porsche Museum sent eleven cars from its collection to Styria in Austria. Just under 200 drivers and their co-pilots completed a course of roughly 800 kilometres divided into several stages. The aim of the classic rally was to drive the cars at constant speed and not to drop below average minimum figures. So the teams went to the start in a sporty frame of mind: if they were too late passing light barriers placed along the routes, they would collect penalty points. The intermediate stops in picturesque spots provided plenty of additional diversion. More photos are provided in the picture gallery on the left. Taking place at the same time as the Ennstal-Classic was the Racecar-Trophy which is a rally for classic race cars. Porsche took part with a large number of entries. The high-performance sports cars were driven by celebrity race drivers. No less than Marc Lieb sat at the wheel of a 911 GT1 from 1998, while Jacky Ickx drove a 550 Spyder from the year 1955 and Walter Röhrl a 718/8 RS Spyder from 1962. The 70th anniversary of our original sports car was the pivotal point for a series of events around the world. Rennsport Reunion will take place again at the end of September. Impressions from the reunion in 2015. The Porsche Museum is competing at the 25th Ennstal-Classic.